Human resources management is no easy job without good solutions. Edraw is a capable facilitator which can tackle many difficult problems and tasks for HR staff. To get your job done easily, try Edraw. Edraw's biggest advantages lie in its ease of use and abundance of functions. HR professionals can benefit a lot from its visualization outputs. It can also save time and increase work efficiency. Users can draw a host of diagrams with Edraw to facilitate work. Edraw requires only a few minutes to create org charts, but offers a lot of benefits. 29 organization charts are included in total. With org charts created by Edraw, HR managers can know their workforce like the palm of their hands. With org charts posted on company intranet, all employees can access them easily. This enhances communication and harmonious relationship between employees. To organize work and collect necessary information, forms or sheets are indispensable. Sometimes, HR workers need to standardize these materials for easier analysis. Edraw' Forms maker enables you to design, share and print all necessary sheets. Application Forms - Gather applicants' information. Employment Form - Keep track of employment situations. Check Sheets - Collect data about work situations in real time. Time Sheets - Record the hours worked by employees. Employee Information Forms - Keep employees' names, contact information, birthdays and other related information. Evaluation Tables - Used to assess staff performance. Calendar - Help all employees become clear of company schedule. 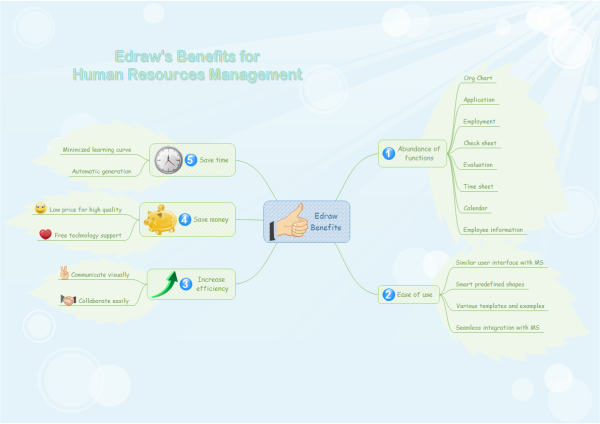 With so many functions and examples, Edraw is the most capable facilitator for HR professionals. If you want to save money and time while gaining quality product and service, Edraw is definitely the perfect choice.